Raised in NY and Aspen, CO, Linda spent her childhood in the quaint countryside of New England and in the rugged wilderness of the West. She benefited from a multicultural background, rooted in appreciation for the arts. 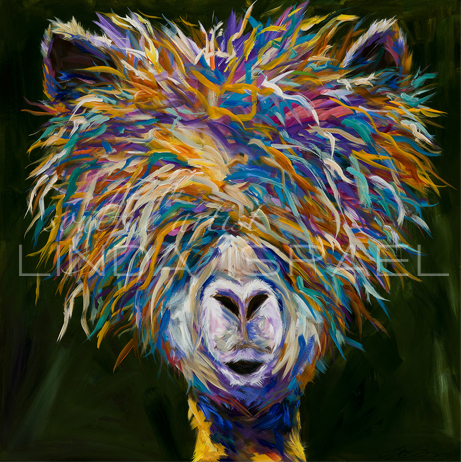 Linda studied fine art at CU-Boulder before returning to Manhattan to study interior design. She worked as decorating editor for House Beautiful and went on to work as an interior designer in NY, Seattle, and Denver. She was often commissioned by clients to paint murals and enjoyed painting the animals she couldn't have in the city. In Washington, Linda spent 10 years living or volunteering on farms. Each day spent with animals resulted in a deeper affinity and appreciation for their innate beauty and innocence. Before returning to Denver, she cofounded the Olympic Wildlife Rescue Center in Olympia, Washington. Shortly after deciding to focus solely on her painting 7 years ago, a friend casually invited Linda to participate in an art show. To Linda’s surprise, all of her paintings sold that evening. Her painting career has evolved effortlessly ever since. Linda is now collected internationally and featured in various galleries and upscale boutiques in Colorado, New Mexico, Utah, and Wyoming. Linda lives at the base of Rocky Mountain National Park in Grand Lake, Colorado with her husband Greg, and her Basset Hound, Lulu. They share 4 kids and 9 grandchildren.